Just saw this for the first time a few nights ago!!! I'd like to see Paul as the British officer if they ever did remake it! I guess there's really no need to remake the film, since the original is wonderful. Just self indulgent on my part. Oh well. I do think the British officer's part could be developed a little more, though. If you want to see a lovely romantic tearjerker, check this one out. On the eve of World War II, a British officer revisits Waterloo Bridge and recalls the young man he was at the beginning of World War I and the young ballerina he met just before he left for the front. He meets Myra on the bridge. Myra stays with him past curfew and is thrown out of the corps de ballet when she misses a performance. He's sent to the front and she survives on the streets of London, falling even lower after she hears her true love has been killed in action. But he wasn't killed. He returns. I'd love to see how Paul would handle this romantic lead role. Roy, the British officer is an odd role, I thought. Probably because I'm looking at it with today's sensibilities. He's got some issues too. 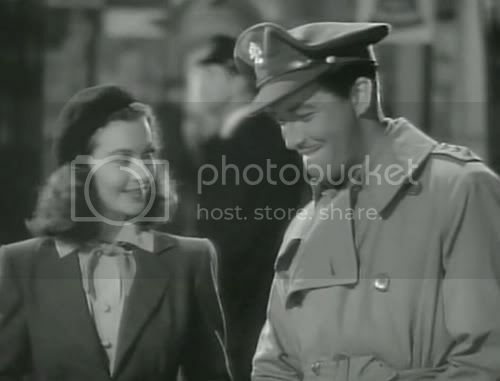 The officer is very drawn to this mysterious young woman, and yet he has no understanding of what she's about because he's so optimistic and has had a pretty easy life. He's in such denial! That's what makes his role very interesting, or something developed more in a remake, that it could be more so. When Roy meets her he senses that there's some dark, troubled problems that go beyond the pretty face and sweetness, but then he doesn't have enough time to think about it too deeply because he's going to be sent to the front. And besides, that's such a downer! It seems. If it aint broke, don't fix it. It's not really in his nature or upbringing to see the world as a glass that's half empty, as Myra sees it. At least, before he's sent to the front. And that's where they could have developed his role more, after he returned, after what he'd seen and experiernced of that war. Supposedly the playwright was very anti-war, and I wonder how much was changed of his work. 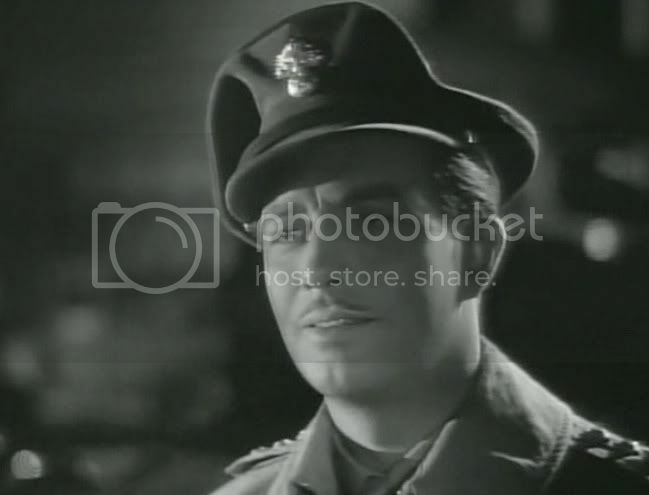 Anyway, because the movie was made in 1940, before the US was officially involved, but gearing up for it....they didn't want to bum people out with a dissillusioned, war-weary soldier, I guess. All in all, the story is romantic, though sad. I even took some caps. 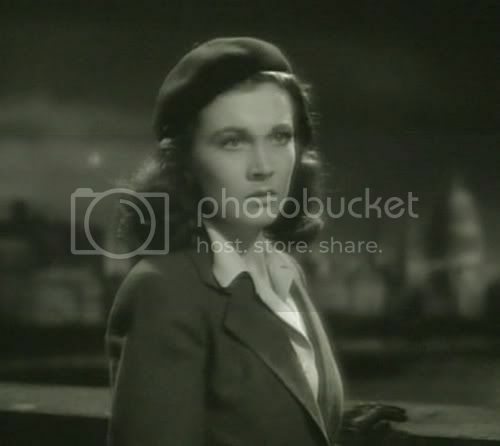 Vivian Leigh, as Myra, a beautiful ballerina dancer from Birmingham was brilliant. There's something sadly tragic about her character, right from the beginning when she's still so young, innocent and sweet. Though she's delightful company for Roy, very lady-like and articulate, there's a very dark undertone of the tragic lingering just beneath the surface....Low self esteem and little expectations out of life. Life to her, up till then, was a matter of just going through the motions. The reasons are never shown or made clear as to why that is. She's an odd, other-worldly character, but brilliantly played by Leigh. I don't know of many actresses that could pull this one off so well--that duality. I can't help but think of how similar Leigh's performance or Myra's character is to...Blanch Dubois! From Tennessee Williams' Streetcar Named Desire. Streetcar wasn't written till 1947. Interesting. It's the characters that really make this such a classic. Myra and Roy meet on Waterloo bridge during an air raid. They find shelter in a crowded undergound station and get to know each other a little. 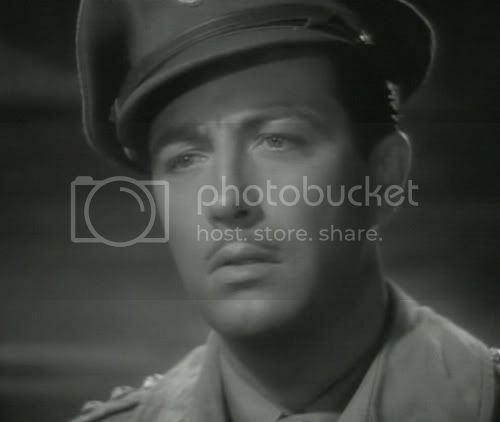 Robert Taylor as the upper class British officer. He's very positive, upbeat, willing to take chances, hopeful and very intrigued by and drawn to Myra's "strangeness." There was something so honest and simple about the dialouge in these beginning scenes. I like them the best. I like this shot where he's about to laugh at something she's said. They were both so very good in this film. And further, she suggests that they should just say good bye. He agrees to the logic and they part. After he made an effort to see her dance in the ballet, canceling an important dinner with his colonel, she agrees to go to a late dinner with him. He walks her home and as they're parting, very late, she tells him she doubts if he will even remember her, and so, why should they bother seeing each other. He describes her as "defeatest". They part. But he can't seem to get her off his mind, so he comes back the next morning. She decides to go out with him after that. He's more smitten than ever and asks her to marry him--he's very sure of her. She says yes..but is very uncertain and gives him ample opportunity to back out of it, saying to him...are you sure, are you really sure? He's certain of one thing, he loves her. Before they can marry, he's sent to the front. She tires to see him off at Waterloo station, but just misses him. When she returns late to the theatre, she and her friend Kitty are dismissed by the dance company. The two women are out of work. Time goes on. Roy was reported as dead. She's near to a break down at this point, and she and Kitty are really down on their luck. Myra cares little for herself, even less than before. She's depressed! The seasons go by and she still can't find work anywhere. She hadn't been aware, but her friend and roomate Kitty, has already resorted to prostitution to pay their rent and buy food. One day while walking along Waterloo bridge, a man approaches Myra and begins by talking about the weather as his pick up line, and then he makes her an offer. She is appalled at first, and then for whatever reason, probably because she just doesn't care...she takes him up on it. Months later, Myra's been picking up men and getting by as a prostitute. 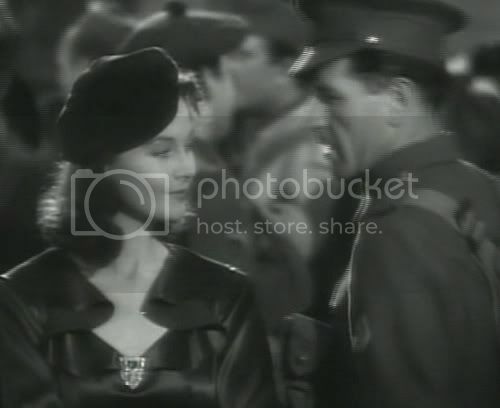 Here, she's walking through the train station, glancing seductively at the soldiers as they pass her by upon their return home. It was one long shot. She powders her nose and checks her makeup...her eyes keeping watch on the clientelle. 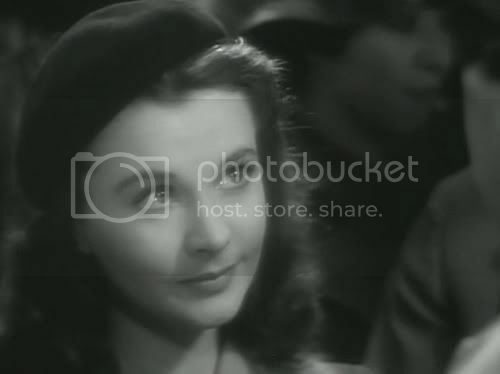 Though in her face, there's a few brief moments of that sadness too, only for a moment, then she bucks up and smiles and goes on....This was a great scene, her eyes and expression. Roy returns, delighted to find her again. She tries telling him why she seems so unhappy, but she isn't able to. He's also in denial that there's ever been anything wrong. He dismisses it. Since he's back now, he thinks her present unhappiness is transitory. And he thinks he canl make it all better. He insists they marry. She finally agrees. She gets on fine with his family. But in the end, she can't go through with deceiving him and leaves. No one can find her. Roy searches for her and asks Kitty what's been going on. 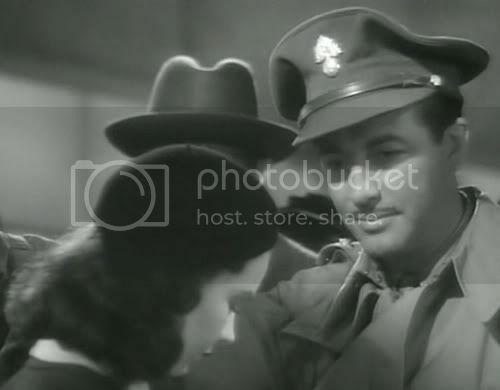 Kitty, gives Roy a Jack Nicholson kind of speech, "You can't handle the truth!" But instead of telling him, she takes Roy to all the places where Myra would pick up men, as they search for her. Roy can see that all the bartenders know of Myra pretty well. "No, Myra ususally doesn't show up till midnight." By the fourth hang out bar, it finally sinks in what Myra's been up to since he's left. He suddenly realizes he's never really understood Myra's complex nature, her flaws and weaknesses, her low expectations in life. Myra commits suicide on the bridge. SIGH :oops : ! She's always been an enigma to him. 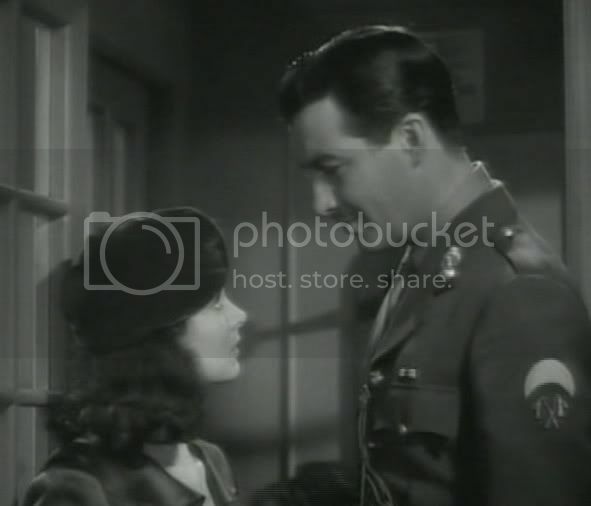 So, twenty something years later, Roy is still thinking of her as he is about to be sent off to the next war. He has never forgotten her.